Immerse yourself in our remarkable educational programs! 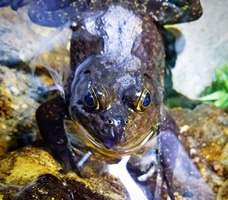 FrogWatch USA is the Association of Zoos and Aquariums' (AZA) citizen science program and provides individuals, groups, and families opportunities to learn about wetlands in their communities by reporting on the calls of local frogs and toads. FrogWatch is a great way to get outside and learn about your local wildlife, even in the middle of the city!